Sussex Wildlife Trust has over 30 nature reserves and many of them offer lovely walks for yourself and your dog. What does it mean to own a dog and enjoy the countryside? It can mean lots of fresh air, great views, and fantastic wildlife watching opportunities but also responsibility. Walking in the countryside often means seeing and coming into contact with farm animals. The Sussex Wildlife Trust manages many of its nature reserves using sheep, cattle and sometimes ponies to graze our sites. They are an important part of the day to day management of our grassland and heathlands. When meeting a sheep with your dog, it can be stressful for both yourself and the sheep. A sheep will often run and if chased when pregnant can abort lambs. Sheep are easily brought down by a dog, which will often injure or even kill it. For the sake of sheep please put your dogs on a lead when in the vicinity of the flock. Coming across cows does not mean you have to put your dog on a lead. In fact if an inquisitive cow wants to take a look it is better for you if the dog is free to get out of the way. The cow is usually more interested in your dog than you. Ponies are very inquisitive about everything and will often come and have a look. Make sure you and your dog avoid touching or stroking the animals and avoid being kicked by not approaching from behind, as they can often lash out if frightened. Please don’t leave it. Bag it and bin it. Many nature reserves volunteers will get home to find it on their clothes and shoes. Not very pleasant. Many animals, especially birds and reptiles are vulnerable to a dog running through open ground and grassland. Nests can be destroyed, adult birds can be frightened off and young chicks left to die. Adders can be disturbed and react when dogs are running through long grass and scrub. It has been known for dogs to be bitten by adders causing serious harm. Very often they just want to go and hide away from disturbance. Try and keep your dog on a lead or close to you where nesting birds or adders are known to live. 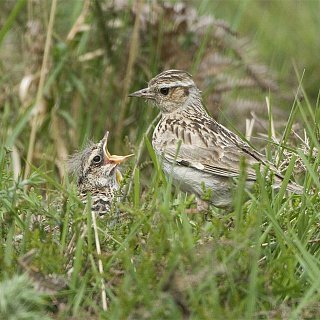 When checking out where to walk follow our links to individual nature reserves and you will find out whether they are grazed or whether ground nesting birds and adders are known to be found.